I participate in many conference calls. Scheduling calls with clients, listening to webinars, and participating in ACT workgroup calls are just a few examples. For most of these calls, I need to use my cell phone to join the call. Using your mobile phone to dial a long conference call number is a pain. First, there is the phone number and then the dreaded passcode! It might be my age, but I find it almost impossible to remember the correct passcode. You certainly should not try this while you are driving! Once I do get on the call, if I somehow lose connectivity I have to go through the entire process again. It is very frustrating. Several years ago I discovered an app for my phone — MobileDay — that allows me to dial into a conference call with just one touch. It continues to be one of my more useful apps! You allow MobileDay access to your calendar. 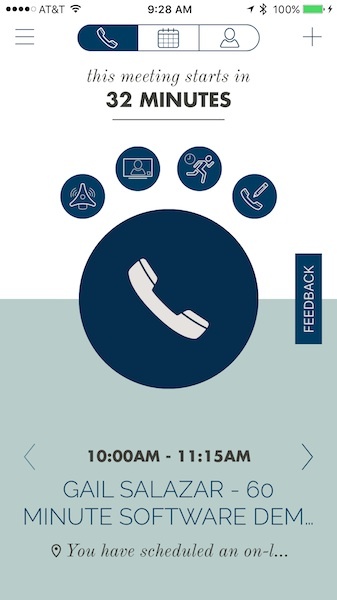 MobileDay can recognize the calling pattern for all the main conference services. So, as long as you have the conference call number and passcode as part of your calendar entry, you simply touch the big button with the phone on it and the conference call number and passcode will be dialed for you automatically. This one-touch dialing feature works both as a host of a teleconference or as a participant. Since connectivity can be iffy on a cell phone, MobileDay allows you to reconnect with just one touch, minimizing downtime. If you are running late, you can send a message to all attendees letting them know via email or SMS. MobileDay is available in the iTunes Store, as well as on Google Play as an Android app. The basic app is free and is likely all you need. There is a MobileDay Business version for an additional cost that allows managing multiple employees. This app continues to be a very useful tool that I use often. It makes joining conference calls quick, easy, and painless. What tools have you found useful for your conference calls? Let me know.